The temple is located in Malappuram district, Mancheri taluk, Thrkalangodu village. To reach this gramakshetra one has to travel about 6 kms from Mancheri in the Mancheri-Nilambur bus route and get down at Amabalanata bus stop. From the bus stop it is a distance of 300 meters to the temple. Worship of Subramonia dates back to the Sangham ages, the early period of Christian era. The nucleus of the present temple can claim an antiquity of more than a millenium, based on the Parasurama tradition. This ancient temple house two shrines of Subramonia, the older idol placed in a new shrine and a new idol placed in the older shrikovil. Structure and Architecture: Kaarikattu temple has two shrikovils for Subramonia within the naalmbalam and a separate enclosure for Shastha with its own naalambalam. Of these the shrikovil on the south (Thekkedathambalm) and the shastha temple seem to be the earliest, being ascribed to the tenth century. The later circular shrikovil of Subramonia (Pazhani Murugan) is ascribed to the twelfth century based on an inscription in the Vritta Kumuda of the adhishtana. The temple complex faces east. About 200 meters east of the temple premises is located a large tank. The earlier Thekkedathambalam or the Southern temple is aligned along the eastern gopuradvara in the main facade. This consists of a square garbhagrha with a narrower mukhamantapa fronting it. The granite adhishtana courses of both are continuous and similar in type. While it is straight for the mukhamantapa, the garbhagrha has the adhishtana showing recesses and projections, with division into five bays. The superstructure (bhithi) above the basement is of laterite and plastered over and decorated with Toranas and Panjaras. There are also three ghanadvaras (false doors) on the three sides of the sanctum. It is a dvi-tala structure with the lower roof in tiles and the upper shikhara with copper roof. Shukanasa projections decorate and accentuate the roof line. The broad eves are supported on wooden brackets. There are dvara paalakas on either side of the sopanam with hasti-hasta bannisters on either side. There is a square namaskara mantapa in front of the shrikovil with 16 pillars and pyramidal tiled roof and enclosed with horizontal wooden slats on all sides leaving door openings on the cardinal directions. The ceiling of the namaskara mantapa has wood carvings. The construction of the shrikovil and the mantapa in front are such that the idol can be seen clearly through the openings of the namaskara mantapa. The reconsecrated idol in the old shrikovil is that of Lord Subramonia with his consort Devasena. 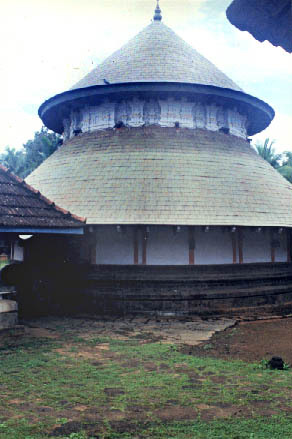 The later Vadakkupurathambalam is also a dvi-tala shrikovil but circular in shape. The basement (adhishtana) is in granite with the usual mouldings and the superstructure is in laterite plastered over with kudyastambhas and simple toranas placed at intervals as decoration. The upper floor walls are plastered and tastefully decorated. There are dvara paalakas in granite on either side of the sopanam. The sopana bhithis (phalakas) are sculptured with lion-motifs. Inside the circular temple is housed a square Dravida vimana serving as the garbhagrha with an ambulatory all around. A row of twelve columns supporting the upper floor along the ambulatory (pradakshina patha) encircle the sanctum which is graced by the renovated old standing image of Subramonia as Pazhani Velayudha. The circular outer wall of the shrikovil is pierced on the four cardinal directions by doors, the characteristic of the sarvatobhadra class of temples. The southern opening houses the pratishtas of Ganapathy and Dakshinamoorthy, while beneath the northern opening comes the simple prnala in granite. In front of the shrikovil is located the open rectangular namaskaramantapa with 16 pillars and pyramidal tiled roof. The ceiling has ornamental woodwork. The valiambalam forming part of the naalambalam is on the eastern side of both the namaskara mantapas in the north south direction. South-east of the Vadakkupurathambalam and forming part of the Valiambalam is the west facing sannidhi (sanctum) of Bhagavathy. Almost in the middle of the valiambalam and protruding towards the front side like an agramantapam is the thitappally (kitchen) with the well close by. The kanni-moola (south-west corner) of the naalambalam accomodates a Ganapathy shrine as usual. East of the valiambalam and facing the thitappally is a shrine of Shastha. Brahmins who migrated from Eka chakra grama in the north are said to have caused the consecration of Shastha here as in the case of Trippanachi Gramakshetra, also in Manjeri taluk. The shastha temple facing west is a nirandhara type (without an ambulatory inside the shrikovil) which is apsidal (gaja-prshta) in shape externally but oblong internally. The structure measures a depth of 1.5 times its width. Its interior is divided into a rectangular sanctum and a mukhamantapa in front. The division, however is not visible on the exterior except for the two protruding granite prnalas on the northern side signifying the two compartments. The adhishtana and the sopanam are also in granite. The superstructure (bhithi) of laterite coming above the adhishtana is plastered over and decorated with ghanadvaras, kudyastambhas and murals. Above the supestructure wall is the wooden roof wrought and put up with a covering of copper sheets. The temple has its own naalambalam surrounding the apsidal sanctum. The dhwaja stambhas (flag staffs) and valia balikkals of the three temples fall in a north-south straight alignment in between the two naalambalams. An exceptionally large rest house and pathayappura (grain silo) border the court yard and the massive outer wall of the complex on the north and east sides. Of the two Shrikovils of Lord Subramonia, the square one on the south is the earliest. Tradition attributes the 'punahpratishta' or reconsecration of a new idol of the lord in the old shrikovil to the loss of the original idol during the troubled days of eleventh century, and the providential redemption of the mutilated old idol from the temple tank on the north east of the premises on the very day of punahpratishta resulting in the subsequent construction of the Vadakkedathambalam (northern temple) to accommodate the old vigraha. It was customary in ancient temples to have Oththu (vedic recitals), koothu (dance drama enacting), paattu (singing religious/devotional songs) and utsavam (festival) as part of offerings to the God. Apart from the present day routine of three poojas, there is an eight day long festival culminating in Arattu coinciding with Thai pooyam asterism. Shri Bhootha bali is also conducted during festival days. All the three temples have separate Tantries; Vellamparambu mana (Peruvanam) for Thekkedathambalam, Poonthottathil Putayur (Thaliparambu) for Vadakkupurathambalam and Mutappilappalli Namboodiri (Manjeri) for the Shastha temple. There is a Kalampaattu festival for Shastha from the first of Kumbham and culminating on the 24th Medom with the ritual Nalikerameru (bursting of coconuts). Thevar Seva (Propitiating the God) or Bhajana is conducted for 12 days during the month of Kanni. This is the simplified modern version of the earlier Vedic chanting (oththu) which used to take place in this temple in ancient days when this gramom was an important centre of Yajurvedi Brahmins. Kaarikattu temple holds the rare reputation of being one of the four places where Atiraatra Maha Yajna has been performed in the 20th century, much earlier than the much publicised Atiraatra at Panjal in the seventies. The valiambalam of the temple has been the venue for the regular enactment of Koothu and Kootiyattom. Koypa Chakkiars of Vanneri in Eranadu who later moved over to Thrkkalayur had the right to perform Koothu in the Kaarikattu temple. The ground plan of the Shastha shrine at Kaarikattu is rather unique in Kerala and has its lone counter part in Agastyeswara temple at Chilamakuru in Cuddapah district, Andhra Pradesh. Combination of an external apsidal shape with an internal oblong interior is itself a rare phenomenon and is also by and large an indication of an early date for the structure - at least the first half of 10th century A.D. The old square shrikovil of Subramonia is also dated to 10th century. The annual report of Indian Epigraphy for 1959-'60 published by the Govt. of India enlists four epigraphs (Nos. 234-237) pertaining to kaarikattu temple. All the epigraphs are assigned to 11th century on Palaeographical grounds. Of these, two epigraphs occur in the corridor of the Shastha temple. ARE 234 of 1959-'60 of Shastha temple refers to an endowment for vedic rituals and for sandal paste for use in Thirukkoyil. ARE 235/1959-'60 engraved in the octogonal Jagathy of the adhishtana of the circular shrikovil of Lord Subramonia refers to an endowment made by Uvaachan alias Iravikalan of Vaiyanadu for the daily offerings to Thirukaarikattu mel thevar. Conculsion: The kaarikattu temple, one of the original 32 gramakshetras, though less famous than many other temples of Kerala, ranks very high in the matter of antiquity, structural diversity of the three sanctums and its role as a vedic centre being the venue of Atiraatra yajna.